Professor Warren White received the B.S. Degree with honors in Electrical Engineering from Tulane University in 1974. He joined the Large Steam Turbine Generator Department of the General Electric Co, in Schenectady, New York we he developed finite element code for generator cross-section magnetic fields. He moved to the Power Transformer Department of GE in Pittsfield, Massachusetts where he analyzed the transient performance of transformer windings subject to lightning disturbances and grid faults. While at GE, he earned a Masters’ degree from Rensselaer Polytechnic Institute in Electric Power Engineering in 1977. He returned to Tulane University where he earned the Ph.D. in Mechanical Engineering in May of 1985. In the same year, he joined the Mechanical Engineering faculty at Kansas State University. Professor White’s research has concentrated on the control of nonlinear, underactuated mechanical systems, wind turbine control, efficiency of indoor electric power distribution equipment, and control engineering education. Of the handful of approaches to underactuated systems, he has developed, with colleagues, two solution processes being the Lambda Method and the Direct Lyapunov Approach. Both of these developments were funded by the National Science Foundation with Professor White as the primary investigator for the research projects. The work regarding the efficiency of indoor electrical power equipment was funded by the American Society for Heating, Refrigeration, and Air Conditioning Engineers (ASHRAE) where Professor White authored a design guide for estimating the heat dissipated from the power equipment. The wind turbine control work has been continuously funded by the industry sponsored KSU Electric Power Affiliates Program. Recent publications have covered power generation optimization and active control of vibrations. Professor White has authored many papers with his Ph.D. and M.S. students. Professor White has been instrumental in helping to develop both the Measurements and Instrumentation Laboratory and the Automatic Controls Laboratory, two undergraduate laboratories used by our students. The Controls Laboratory began with a grant from the National Science Foundation. He has served on the program committee and has served as an associate editor for many domestic and international technical conferences, notably the American Control Conference and the ASME Dynamic Systems and Control Conference among others. He has received best paper awards and has presented several invited papers on the topics of wind turbine control and control education. 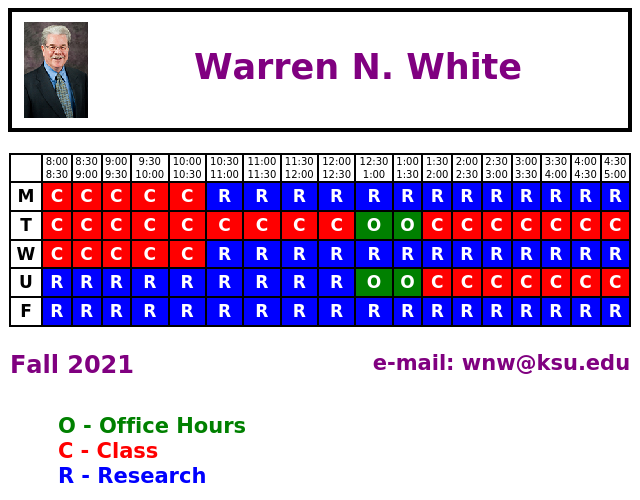 Professor White has developed research programs for undergraduates where the research is organized around the support of the Controls Laboratory. The undergraduates include both mechanical and electrical engineering students. Several of these support projects have resulted in technical papers co-authored by undergraduates. Invited sessions at technical conferences on the topics of wind turbine control and control education have been organized by Professor White. He serves as the co-advisor of the Collegiate Wind Competition team which is sponsored by a grant from the Department of Energy. Professor White is also the co-advisor of the KSU Rocketry Club.